​Member, non-member and student tickets available. Call Gale Roy at 225 638-6049 or 718-1574 for additional information. What is "Calling All Artists"? 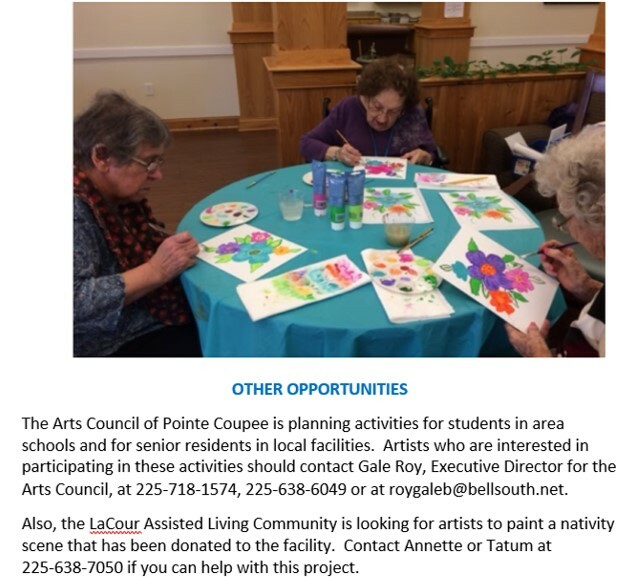 In October, 2009 a group of local artists gathered with members of the Arts Council of Pointe Coupee to have a conversation about how the Arts Council could better serve the needs of our local artists. From that discussion, a series of activities have taken place to involve artists (and art appreciators) in networking, sharing, learning and exploring. Workshops, show and tell activities, demonstrations and field trips are among the many activities the Arts Council has sponsored for children and adults. 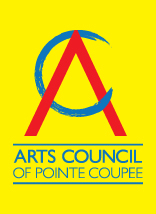 Additionally, the Arts Council has hosted 9 Treasures of Pointe Coupee Art Exhibits. 807 local and regional artists have showcased 1,241 pieces of artwork. Who can attend "Calling All Artists" activities? Activities are planned for local and regional artists and art appreciators. Membership is not required, but when there are registration fees, some workshops are offered to members at a reduced price. Some activities are planned specifically for children and some for adults. Where are the CAA activities held? The majority of CAA activities are held in the Arts Council's annex room at the Poydras Center on Main Street in New Roads. The annex building is located to the left of the Poydras Center as you face the main building; it is under the oak tree and near the gazebo. Occasionally, CAA activities are held off site when "field trips" are planned to artists' studios, exhibits or special activities. When are CAA activities held? Activities are typically planned on the second Wednesday of the month, but they can also be planned as Saturday events. Wednesday events begin at 6:00 p.m. and are usually over by 7:30. Calling All Artists Schedule for the current year is located to the left on this page and on the EVENTS page of our website.